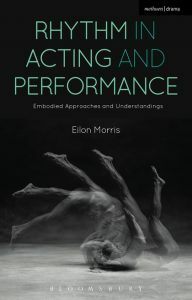 In July 2017 I publishing of my first book, Rhythm in Acting and Performance: Embodied Approaches and Understandings, released through Bloomsbury, Methuen Drama. This book was written and compiled over an eight year period, through enquiry, collaboration, discussion and play in the field of rhythm and performance. Informed by my own practical knowledge of working as an actor, percussionist and educator, this text discusses the ways practitioners approach, embody and understand rhythm within their creative work and play. 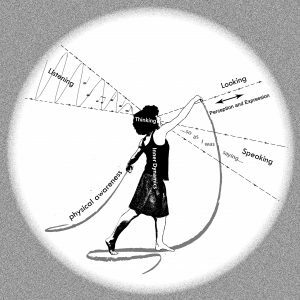 Rhythm in Acting and Performance traces this common and yet diverse subject through a range of contexts and perspectives, including the work of Konstantin Stanislavski, Suzanne Bing, Jerzy Grotowski, Anne Bogart, John Britton and the author’s own practices as a trainer and performer. Including topics such as ensemble, improvisation, voice and ritual, this text examines these familiar performance themes through the lens of rhythm, emphasising rhythms role in uniting performers, inspiring vitality, shaping meaning and states of consciousness. Offering informative and useful insights to aid and inspire further creative and academic explorations, and including case studies, practical examples, analytical reflections and interviews, Rhythm in Acting and Performance is an ideal guide for students and practitioners.